In a time when the Kings Of Leon’s last two outings have been less than desirable, if you enjoy rock & roll that is, and the White Stripes haven’t released an album in what might as well be decades, my daily fix of black tar rock & roll has gone lacking. I find myself ripping and yelling, while listening to “T.V. Eye”, longing for a hideous, two headed jackal, smoking cigarettes and drinking recklessly to manifest itself in a modern band that doesn’t have cliche, or contrived written all over them. Loud, shrieking guitars, blood soaked, withdrawn and demonic. Wrapping wisdom around my skull, constricting until my head pops. And like their namesake, a revolution. Enter 1776. 1776 is a garage rock band worm-holed straight out of 1966. Featuring covers of “Stepping Stone” and various other classics, the band has channeled a feeling, not so much nostalgic, much more genuine and organic. The entire band is underage, yet play with the power and prowess of a seasoned club circuit quartet. Nigel (guitars/vocals) shrieks and wails, working himself into a frenzy on ridiculous solos. Chris (guitar/vocals) provides a rock solid rhythm guitar, a little funky friction to play counterpart to Nigel. Mitch (drums) and Zach (bass) grind up an excellent rhythm section, minimalist, but not without creativity, like churning butter with a machine gun. When performing live the band pulses, and burns through numbers like a lost train careening down a track to hell. This isn’t metal, this isn’t punk, it’s pure rock and roll the way it was meant to be played. 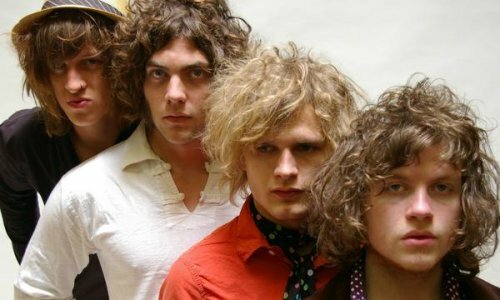 If you miss the Stripes and have lost faith in the Kings of Leon, longing for the Youth and Young Manhood to come back, then this band is for you. They play regularly throughout the northwest, primarily Portland and Tacoma. And with their recent signing to Beat The World Records (recruited by fellow Portland Rockers, and now label-mates, The Dandy Warhols), they shall embark on a West Coast tour throughout the end of September with a stop at the Clean Air Clean Stars festival with the Dandies as well.